GitHub - claudiospizzi/ISEPresenter: PowerShell ISE Add-On for presenting scripts and demos with a remote control. 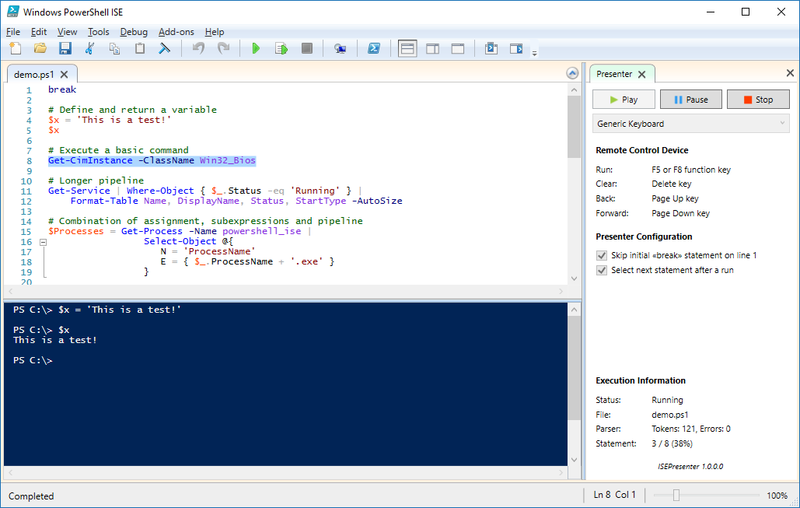 PowerShell ISE Add-On for presenting scripts and demos with a remote control. Want to be notified of new releases in claudiospizzi/ISEPresenter? The ISEPresenter is a PowerShell ISE Add-On, designed to give teachers and speakers an easier way to present PowerShell scripts or demos inside the PowerShell ISE. In addition of just executing the statements step by step, the ISE Presenter module also provides support for remote control devices like the Logitech Presenter R400. Thanks to this support, it's possible to execute the scripts or demos with a remote control. After you have installed the ISEPresenter module, just start it by importing module inside the PowerShell ISE with the command Import-Module ISEPresenter. The Add-On will apear on the right side. After the presenter was started, it will parse the current active opened script file and afterwards highlight the first detected statement. Now you can use the remote device to navigate throught the statements (back / forward), execute the current statement (run) or clear the PowerShell Console (clear). The active key or button for this actions depends on the selected remote control. You can find a short descripton below the dropdown box. If you have completed your presentation, stop it with the according button. After you have stopped, the remote control device will no longer be active. To present a script or demo, not only dedicated remote control devices are suppored. You can also use the keyboard. Therefore four keys are bound to special functions during the presentation. The Logitech Presenter R400 is designed to control PowerPoint slideshows. With the ISEPresenter module, this device can be used to control a PowerShell demo. Please feel free to contribute by opening new issues or providing pull requests.